"A story about the European Union in 2020"
Eurux is Europe’s new operating system, developed by the European Union. It will be this decade’s most important contribution to the unity of Europe. 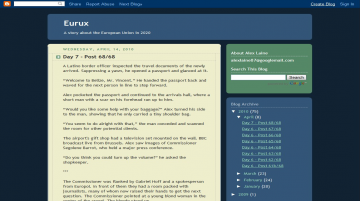 Alex Laine, a technical administrator on the Eurux project, is accused of having infected the Eurux main server with a Trojan. Trying to decrypt and expose the harmful code that got him into trouble Alex becomes a fugitive, not only from Union representatives afraid of scandal. Someone else out there, with seemingly unlimited resources, will use any means to stop him from finding out the true nature of a Trojan set out to infect hundreds of millions of computers. This is a story about the European Union in the year 2020. Eurux has not been tagged yet. Help others find Eurux by tagging it! Eurux has not been reviewed yet. Eurux has not been recommended yet.